Before kicking off this weeks edition of book reviews and travel tips, I would like to respectively request we take a moment to give thought to the victims of the tragedy in Tucson and their families. This is a time that calls for putting aside differences and drawing together as a nation. Today’s offerings are another mixed bag. We have cameras, an interesting glimpse into World War I vehicles, classic American station wagons, a few notes pertaining to Checker, and a couple of great weekend getaway suggestions. Lets start our reviews this morning with a report on the newest addition to our toolbox, a Canon EOS 50 D that was first introduced to the market about two years ago. Even though the camera is new, the recent introduction of more advanced models by Canon allowed us to purchase it at a discount price. We did not jump into this purchase without serious consideration. The decision was made after extensive research and a great deal of homework. One of our primary resources that http://rcm.amazon.com/e/cm?t=1968adventurer&o=1&p=8&l=bpl&asins=B001EQ4BVI&fc1=000000&IS2=1&lt1=_blank&m=amazon&lc1=0000FF&bc1=000000&bg1=FFFFFF&f=ifrcomes with a very high reccomendation for those giving thought to a similar purchase, is a well written, easy to follow book, Canon EOS 50D http://rcm.amazon.com/e/cm?t=1968adventurer&o=1&p=8&l=bpl&asins=0470455594&fc1=000000&IS2=1&lt1=_blank&m=amazon&lc1=0000FF&bc1=000000&bg1=FFFFFF&f=ifrwritten by Charlotte K. Lowrie. With the camerea in hand my first impression is that we, as in us and those who enjoy photography for fun or profit, have moved from using a camera to capture our favorite images to packing around a photographic processing computer. I am quite confident we will be able to figure out the intricacies but if you are a novice or simply want to snap pictures, this camera is not for you. If, however, you want to get a bit more serious about photography without totaling breaking the bank, or your interest leans toward the semi-professional side, this camera should be a serious consideration. Like a kid at Christmas, even though I was running late, I ran outside the morning after the camera arrived to take a picture of Barney and the Jeep under a rare dusting of snow. This photo was taken shortly before sunrise with nothing more than the auto setting. 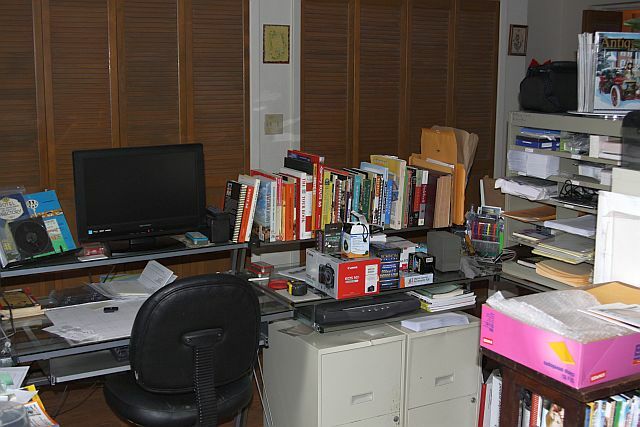 My dearest friend has been playing with it a bit around the house but my schedule made it difficult for me to find time for more than cursory glance and a few quick shots of my “Fortress of Solitude”, aka my home office. After about a week of high temperatures hovering around the freezing mark, yesterday was warm and sunny which made it an ideal time to take to the road. So, after work we loaded the Jeep with camera gear and set out on the pre 1952 alignment of Route 66 into the Black Mountains. Two conclusions were derived after our expedition. One, with this camera and lens system we should be able to supply excellent photos that are so clear the viewer will feel the warm, sage scented breeze on their face. Two, I have lots of homework on the horizon to reach that point. As we are on the subject of travel and road trips let me share a bit about my secret destination of the week, Glenwood near Silver City in New Mexico, and the surrounding area. Ghost towns, wilderness, art galleries, fine dining, museums, miles of scenic forest service roads, and stunning and majestic landscapes are just a small part of the allure found within 100 miles of Glenwood. Driving to Glenwood, from any direction, sets the stage for the adventure. From Kingman we drive to Holbrook and turn south on U.S. 180. This takes us through the Painted Desert, the Petrified Forest, and then high into the White Mountains with deep forests of pine, spruce, and even aspen. 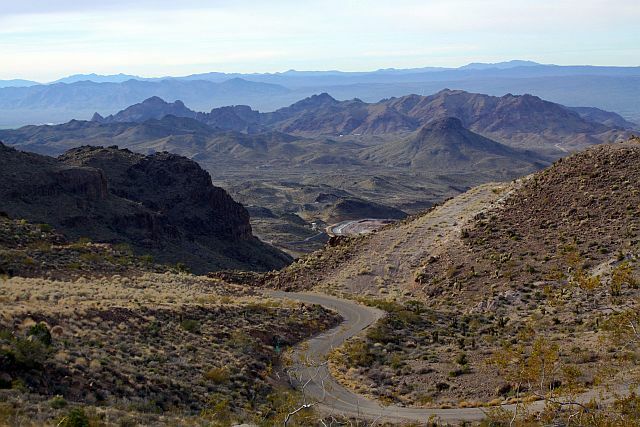 At the New Mexico state line the road begins to descend through a series of twists and turns, through small villages unchanged in a half century of more, and across jaw dropping landscapes of awe inspiring western scenery. Even though it is less than a five hundred mile drive, we usually end the day in Glenwood, a picturesque little town on the San Francisco River where the illusion is that the clock stopped just shortly before Ford Motor Company introduced the Edsel. The White Water Motel, with its long shaded veranda overlooking the San Francisco River, remains as it was when we first stopped there in 1970 and at that time it looked as though nothing had been changed since 1940. The old motel fills four of my basic requirements in lodging when on the road; clean, scenic, quiet, and reasonable. The fifth is availability of good food and in Glenwood that is found at the Blue Moon Cafe, a short three block walk over the San Francisco River Bridge. Stopping here allows for us to begin the day with two wonderful side trips, one to the delightful old mining town of Mogollon and the other to the Catwalk, a scenic trail in a park like setting, or to establish a base camp for our various excursions. There is a general store and gas station in Glenwood but if you haven’t brought supplies for camping and your adventures Silver City is only about seventy miles to the east. Now, lets talk books. The first on this mornings list of recommendations is American Station Wagons: The Golden Era 1950-1975http://rcm.amazon.com/e/cm?t=1968adventurer&o=1&p=8&l=bpl&asins=1845842685&fc1=000000&IS2=1&lt1=_blank&m=amazon&lc1=0000FF&bc1=000000&bg1=FFFFFF&f=ifr by Norm Mort, another excellent title by the British publisher, Veloce (http://www.veloce.co.uk/). Norm Mort has an interesting resume that is reflected in this book. At age twelve he was the youngest member on the executive of the Antique and Classic car Club of Canada, Toronto Chapter. Since that time he has written extensively on automotive topics for a wide array of international publications. In addition to the reproduction of vintage advertisements and factory photos there are museum quality color photographs of restored models representing even obscure manufacturers such as Studebaker and Nash. Informative, concise, well written text with a very nice index and production data round out the package. The book leans toward the coffee table side rather than actual read or research. Still, for the average automotive enthusiast this book will most likely fill a gap in the book shelf and in general knowledge. http://rcm.amazon.com/e/cm?t=1968adventurer&o=1&p=8&l=bpl&asins=0786439602&fc1=000000&IS2=1&lt1=_blank&m=amazon&lc1=0000FF&bc1=000000&bg1=FFFFFF&f=ifrThe next recommendation is an offering from the talented author, Albert Mroz, and McFarland Publishing (http://www.mcfarlandpub.com/). The title presents the illusion this book is a dry, dusty tome that might be better utilized as a sleep aid. However, American Military Vehicles of World War I: An Illustrated History of Armored Cars, Staff Cars, Motorcycles, Ambulances, Trucks, Tractors, and Tanks is a very fascinating, heavily illustrated 326 page book that does an excellent job of chronicling an often overlooked, obscure, but interesting chapter in American automotive history. Albert Mroz is a member of the Military Vehicle Preservation Association, the Society of Automotive Engineers, the Society of Automotive Historians, and the American Truck Historical Society. He is also on the advisory board of the Hays Truck Museum. If I were to find fault with the book it would be in regards to price, $45.00. Still, if this is topic of interest, I challenge you to find a better researched or well written work than this. Hi. Sorry to disagree. I'm not an expert on U.S. vehicles of the period, and I read the book on the assumption that Mr. Mroz would know his stuff. However, I have studied early Tank development for many years, and I have to say that I have never read such a garbled and historically inaccurate account as Mr. Mroz's chapter on the subject. Parts of it are obviously facts that he has mixed up, whilst others are sheer fantasy. Much of it bears no relation at all to the truth. It's the worst thing I have ever read on the topic. So how certain can I be about the rest of this very expensive book? It's hard to believe that he offered this to a publisher and even harder to believe that it was accepted.